Have you ever wondered why when you look through a welding lens it appears green? Or have you ever asked why the front of auto-darkening welding helmets are purple? If you have, you are in the right place. If you haven’t, you’re here now and as a welder, you may find the answer pretty interesting. Lastly, if you are sick of seeing green every time you weld, we have a new Speedglas welding helmet solution for you. First, why do auto-darkening welding lenses appear purple? To understand why what you see through a traditional auto-darkening welding helmet appears green, we first need to understand why the welding lens itself is purple. As you know, when a welder strikes their arc a bright light is emitted. What you may not know, is that this light is made up of Ultra-Violet light (UV), Infra-Red light (IR) and Visible Light. An auto-darkening welding lens worn by welders contains a UV/IR filter which is made up of multiple metallic layers and a thin glass substrate. The metallic layers, including 5 silver layers and 6 aluminium oxide layers work in combination with the glass substrate and the polarising filters to reflect and/or absorb the IR and UV radiation. It is these metallic layers which give an auto-darkening welding lens a metallic purple colour. This makes sense when you consider how it reflects and absorbs the RED (Infra-Red) and Blue (Ultra-Violet) ends of the colour spectrum. Red + Blue = Purple. Why do you see green when looking through an auto-darkening welding helmet? The photoreceptors in your eyes are sensitive to light and relay messages to your brain. You are able to recognise objects when light reflected by these objects hit the receptors in your eyes. The three primary colours of light are red, blue and green. Given that the UV/IR filter absorbs the majority of red and blue components of light, it makes sense that the remaining visible light that passes through the lens will appear green. The light transmission curve below shows a visual representation of the remaining visible light (based on wavelengths) that you see through an auto darkening lens. 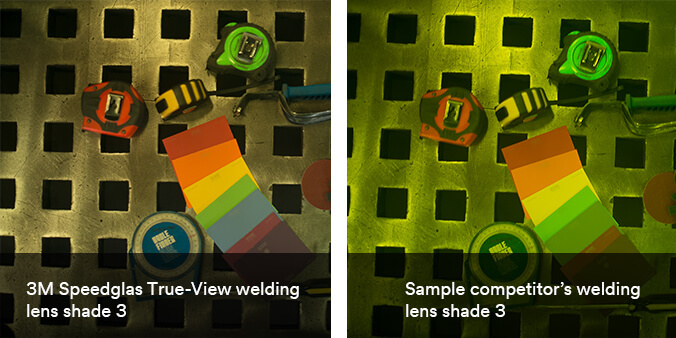 As you can see, the transmission of visible light is dominated by green light, hence why when you look through a traditional auto-darkening welding lens, most objects will appear green. Want a more colour accurate view when you weld? 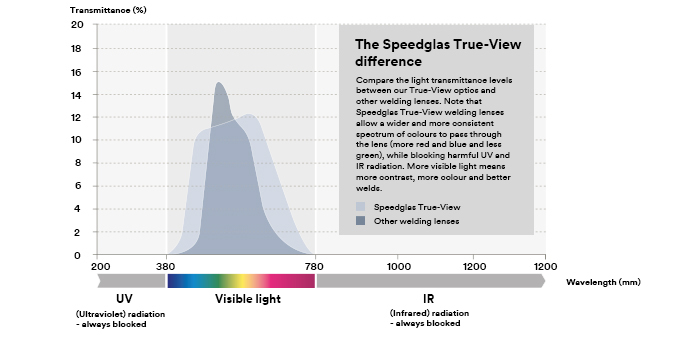 Speedglas True-View technology breaks the trend of traditionally green welding helmet lenses by allowing a wider and more consistent spectrum of colours to pass through the lens while still blocking out the harmful UV/IR radiation components. This allows for a more natural-looking field of vision with greater definition and clearer contours and edges for more precise welding. A more realistic view of your welding set-up and weld pool means greater productivity, as you spend more time welding and less time grinding and re-working. The True-View optics are available in both the Speedglas 9100XXi series welding helmets and Speedglas 9002NC welding helmet. Click on the links below to check out each welding helmet series.